A visitor to the Academy entering through the propylaea, finds himself in a long corridor connecting the Building's two wings. 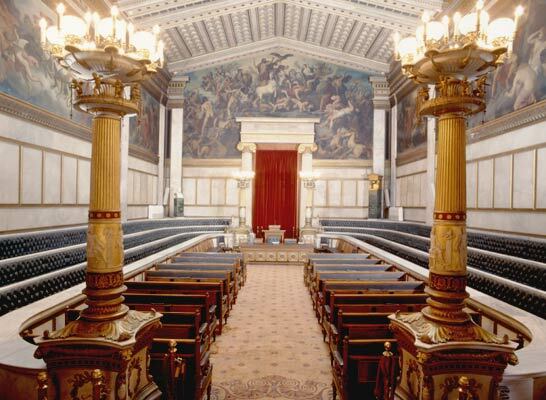 The corridor is dominated on the right by the marble statue of the Benefactor of the Academy Simon Sina, a work by Leonidas Drosis, originally placed at the end of the Academy's Main Hall. SIMON SINAS BUILT THE ACADEMY OF THE GREEKS, HIS SPOUSE IFIGENEIA COMPLETED IT. At the end of the corridor, to the right, the Eastern Hall is located, the ceiling of which is decorated with panels of exquisite artistry. This Hall houses libraries and collections of art deriving from donations, and is where scientific conferences and exhibitions take place. On the left of the corridor are the offices of the academic authorities along with the offices of the Academy's services, and these are also decorated with paintings and other works of art. Off the corridor internal staircases lead to the building's first floor, where the Academy's Library is housed and where the Network Operation Centre is located. 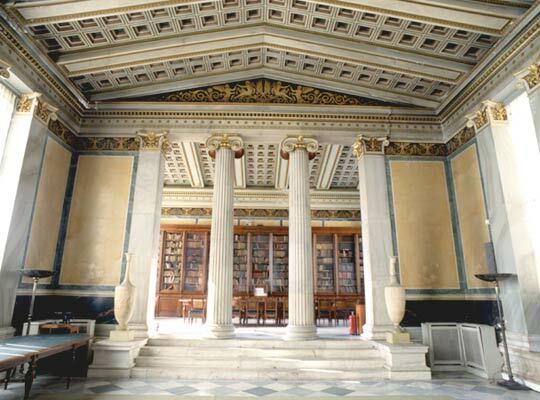 The Academy of Athens' Main Hall is an oblong-shaped room, the length of which is lined on both sides amphitheatrically with three rows of marble seats. Its ceiling is decorated with panels of great beauty. All the Hall's sides are sheathed to a certain height with marble revetments, on which the names of the Academy's Donors and Benefactors are recorded. The Hall's painted decoration extends from the western side all the way to the southern side, a distance of more than 50 meters. 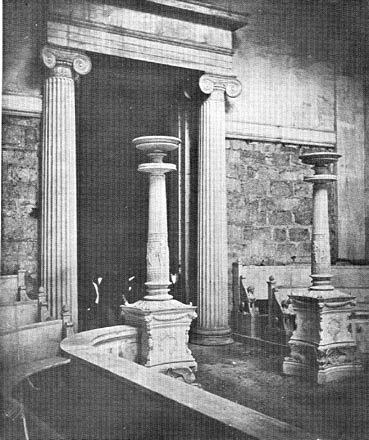 To the left of the Hall's entrance there is a marble bust of Simon Sina, the work of Leonidas Drosis; to the right there is a marble bust of Ifigeneia Sina, the work of Nikolaos Perantinos. Towards the end of the Hall where the rostrum stands, there is a bust of Aristotle on the left and on the right a bronze relief depicting a clock, both of which are donations made by the Benefactors of the Academy Panagiotis and Ioanna Aristofronos. 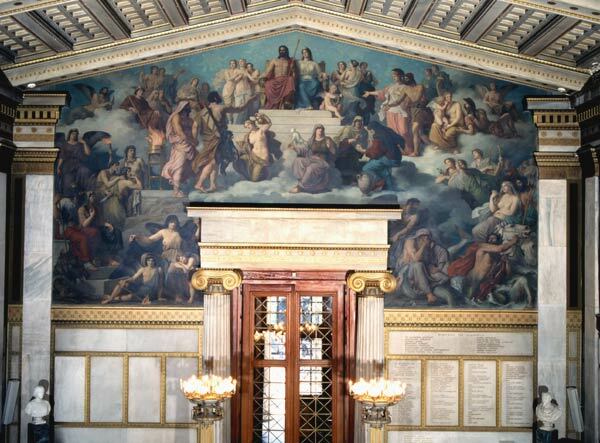 The Hall's decor is completed by four sculpted marble lamp-holders. The pictorial ensemble decorating the Academy's Main Hall was effected over the two-year period from 1878 to 1880; it is the result of Theophil Hansen's inspired design, realised by the Austrian artist Christian Griepenkerl (1839-1916). 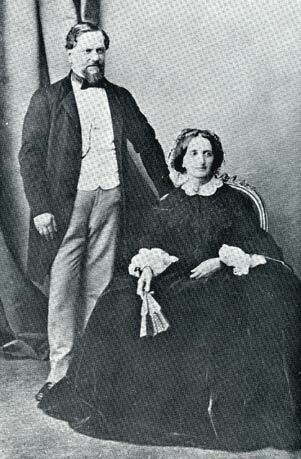 The latter was a student of the great artist Karl Rahl and a Professor at the Academy of Fine Arts of Vienna. This pictorial ensemble begins thematically with Aeschylos' Promitheas Desmotis, but also relies on the international tradition of references to Promitheas. It extends down the western side of the Academy's Main Hall, in eight representations depicting successive phases in the myth of Promitheas. The pictorial decoration begins with the representation referring to Themida's prophecy concerning the theft of Fire and the ensuing suffering of her son Promitheas. This representation is succeeded by those showing the theft of Fire with the aid of the Goddess Athina, the creation of Man by Promitheas and his attempts to give him life with Fire, the clash of the Titans, and Promitheas as torchbearer offering Man the gift of Fire. The representations go on to illustrate Promitheas captive on the Caucasus, the release of Promitheas by Hercules, and the reception of Promitheas by the Gods on Mount Olympos. Hansen… with the Philosophers fronting the entrance, Athina and Apollo on their elegant tall Ionian columns, and the Birth of Athina on the central pediment, reestablishes a connection between the Academy of the present-day and the great tradition of the past, which is the Parthenon, as a condition for the future. Using Promitheas as both the embodiment of and a symbol of human effort, and particularly with his myth…, he poses as yet unanswered questions… [Hansen] manages in images to convey the totality of the tragic content of Aeschylos' poetry, to present the positions of European idealism and the convictions concerning the position and the role of Man in the world… and both seeks to and succeeds in, expressing these ideas and visions not only for the Academy, but for the whole of Greece as well… Particularly with the development of the themes in the myth of Promitheas, and his efforts in aid of Man and Life, the desire for the affirmation of Liberty and his resistance against Authority. Even more for his love of Man... The overall conception of the Academy, its architectural features along with the sculptural and painted decoration, all contribute to an exquisite total. In this way ancient traditions of timeless value are transported through shapes and images to become in turn visions and prospects for the future.